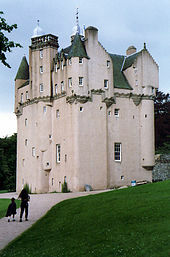 Craigievar Castle, Aberdeenshire, one of many properties in the care of the charity. The National Trust for Scotland for Places of Historic Interest or Natural Beauty, commonly known as the National Trust for Scotland (Scottish Gaelic: Urras Nàiseanta na h-Alba) is a Scottish conservation organisation. It is the largest membership organisation in Scotland and describes itself as "the conservation charity that protects and promotes Scotland's natural and cultural heritage for present and future generations to enjoy". The Trust owns and manages around 130 properties and 180,000 acres (73,000 ha; 730 km2) of land, including castles, ancient small dwellings, historic sites, gardens, and remote rural areas. It is similar in function to the National Trust, which covers England, Wales, and Northern Ireland, and to other national trusts worldwide. The Trust was established in 1931 and (as of 2010[update]) had 450 employees, over 310,000 members, and 1.5 million recorded visitors. The Trust's Patron is Prince Charles, Duke of Rothesay; the CEO is Simon Skinner, and the chairman is Sir Moire Lockhead. It is a registered charity under Scottish law. Originally, the charity owned properties rather than "wilderness" areas. When the Trust took on the management of rural estates there was controversy concerning issues such as the siting of visitor centres and placing of signposts. However, the Trust has learned to adopt a more sensitive approach, even to the extent of removing some intrusive facilities such as the original Glen Coe Visitor Centre. In August 2010, a report called Fit For Purpose by George Reid, commissioned by the Trust, cited shortcomings that were corrected though organizational restructuring largely completed by the end of its 2011/12 Fiscal Year. The stabilisation of the Trust's finances allowed it to make its first acquisition in seven years when it bought the Alloa Tower in Clackmannanshire in 2015. For the year ended 28 February 2015, the Trust's total income was £47 million, down from £49 million in 2013–14. The largest sources of income were membership subscriptions (£12.5 million), commercial activities (£11.1 million) and investment income (£7.6 million). In the same year the Trust's total expenditure was £49 million, the majority of which was spent on property operating and conservation expenditures. As part of its current five-year strategy, the Trust is working to generate additional income and improve operational efficiency with the aim of eliminating its operating deficit by the end of the 2016/17 financial year. Annual membership of the Trust allows free entry to properties and "Discovery Tickets" are available for shorter term visitors. Membership also provides free entry to National Trust properties in England and Wales and Northern Ireland, and vice versa. The Trust has independent sister organisations in the United States (The National Trust for Scotland Foundation USA), and Canada (The Canadian National Trust for Scotland Foundation). The organisation's membership magazine, Scotland in Trust, is published three times a year. For the maintenance of its nature properties, the Trust depends on the contributions of volunteers, with local circles of Conservation Volunteers working on projects during weekends. The charity also organises working holidays called "Thistle Camps" on various properties, with activities undertaken including footpath maintenance and woodland work such as rhododendron control. The Trust manages 129 heritage properties consisting of 1,500 individual buildings, 270 of which are listed. Most grounds and open spaces are open throughout the year but buildings may generally only be visited from Easter to October, sometimes only in the afternoons. The Trust is Scotland's largest garden owner with just under 70 gardens that cover 238 hectares and contain 13,500 varieties of plant. These gardens include 35 "major gardens" with the remainder forming part of other properties. The gardens represent the full history of Scottish gardening ranging from the late medieval at Culross Palace, through the 18th-century picturesque at Culzean Castle and Victorian formality at the House of Dun to 20th-century plant collections at Brodick and Inverewe. The Trust owns large areas of upland, including Ben Lomond. The Trust is the third largest land manager in Scotland, owning 76,000 hectares of Scottish countryside including 46 Munros, more than 400 islands and islets and significant stretches of coastline. Trust countryside properties include Glen Coe, Torridon and Mar Lodge Estate. The Trust's management of its coastal and countryside sites is guided by its Wild Land Policy which aims to preserve the land in its undeveloped state and provide access and enjoyment to the public. Trust sites are home to a diverse variety of native wildlife. The Trust estimate that almost 25% of Scotland's seabirds nest on its island and coastal sites, equivalent to 8% of seabirds in Europe. The Trust's countryside properties are home to native mammal species including red deer, pine marten, wildcat and red squirrel. Since 1957, the Trust have owned and managed the archipelago of St Kilda, Scotland's first World Heritage Site and the only World Heritage Site in the UK to be listed for both its natural and cultural significance. St Kilda and the surrounding sea stacks are home to over one million seabirds as well as three species unique to the islands; the Soay sheep; St Kilda field mouse and St Kilda wren. Across its properties the Trust is responsible for the conservation and display of hundreds of thousands of objects from paintings to furniture and domestic tools. The primary aim of the Trust's curatorship is to present collections and works of art in the historic settings for which they were commissioned or acquired. Crookston Castle in Glasgow was the first property acquired by the Trust. Culzean Castle in Ayrshire is one of the Trust's most iconic sites. ^ "About the Trust". National Trust for Scotland. Archived from the original on 28 February 2013. Retrieved 17 March 2013. ^ "Reciprocal entry sites". National Trust for Scotland. Retrieved 17 March 2013. ^ "Change of chairman for conservation charity". National Trust for Scotland. 28 January 2010. Retrieved 17 March 2013. ^ "National Trust for Scotland, Registered Charity no. SC007410". Office of the Scottish Charity Regulator. ^ "A future for our past". National Trust for Scotland. Archived from the original on 11 January 2011. Retrieved 17 March 2013. ^ Severin Carrell (9 August 2010). "Scotland National Trust properties up for sale after review prompts reforms". The Guardian. Retrieved 17 March 2013. ^ Mark Smith (25 April 2015). "What next for the National Trust for Scotland". The Scottish Herald. Retrieved 16 April 2016. ^ a b c "The National Trust for Scotland: Annual Review for 2014–2015" (PDF). The National Trust for Scotland. June 2015. Retrieved 16 April 2016. ^ a b c "National Trust for Scotland: About" (PDF). The National Trust for Scotland. June 2012. Retrieved 16 April 2016. ^ Greenoak, Francesca (1 June 2005). The Gardens of the National Trust for Scotland. Aurum Press Ltd. ISBN 1845130375. ^ "National Trust for Scotland: Mountains". The National Trust for Scotland. Retrieved 9 February 2018. ^ "National Trust for Scotland: Wild Land". The National Trust for Scotland. Retrieved 9 February 2018. ^ "Collections and Conservation". The National Trust for Scotland. Retrieved 16 April 2016. ^ Alison Campsie (28 January 2016). "In Pictures: Scotland's 10 most popular National Trust properties". The Scotsman. Retrieved 16 April 2016.